Located just a few miles from downtown Pigeon Forge, Amazing Grace is close to the fun without sacrificing a relaxing mountain setting. 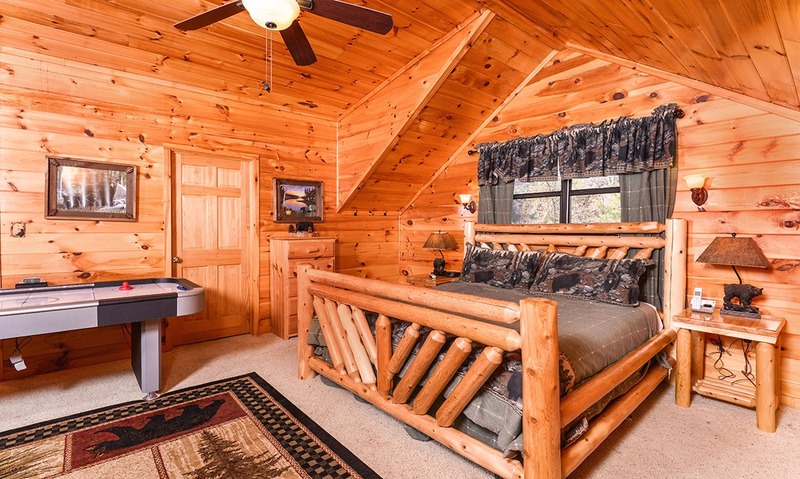 Wooded views impress, and interiors with great space and amenities offer the comforts you want when you get away to the Great Smoky Mountains. 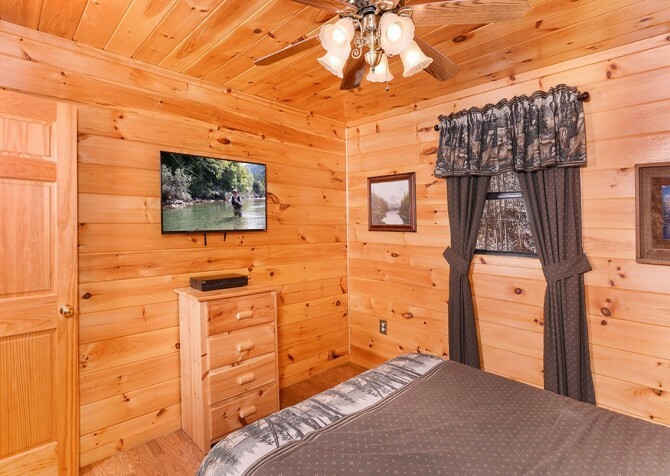 The 2-bedroom +loft, 2-bathroom cabin offers room for 10, so it’s great for families, several couples, and small groups.While you’re not too far from downtown, Amazing Grace has plenty to do in the cabin. A pool table and arcade games, high-speed wireless internet, and big screen TVs with DVD players offer lots of entertainment in the cabin. Want to unwind and relax? 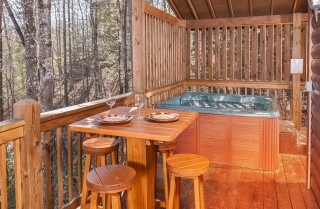 Take advantage of the outdoor hot tub, indoor jetted tub, an inviting fireplace, and peaceful bedrooms. 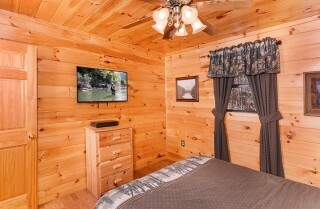 We know you don’t want to give up the conveniences of home when you get away, so Amazing Grace also features a fully equipped kitchen with full-size appliances and tools, TVs in the bedrooms, free long distance, a (charcoal) grill, a washer/dryer, and a flat paved driveway for easy arrivals. Indoors and out, Amazing Grace offers the space, amenities, and atmosphere you want for a memorable Smoky Mountain getaway. 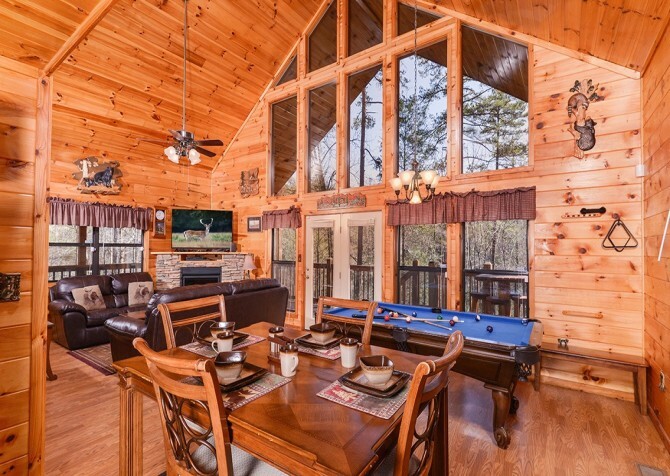 Whether you’re here with family, friends, coworkers, or that special someone, we hope Amazing Grace is the home away from home you want to come back to year after year. 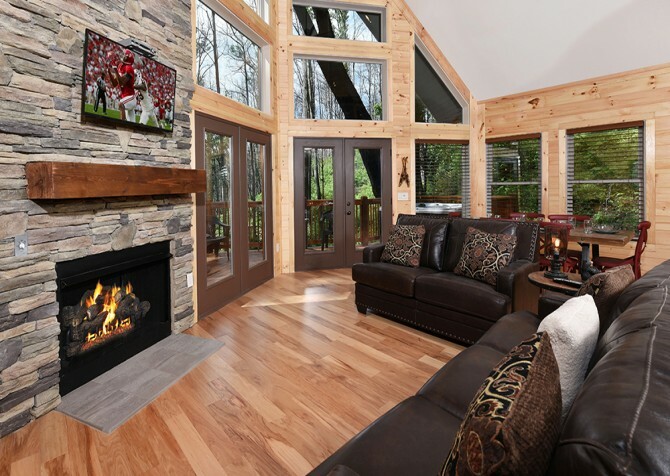 Boasting floor-to-ceiling windows and perfectly cozy couches, the living room of Amazing Grace is the place you’ll want to spend your days around the cabin. Soak in wooded views as you relax, turn on the electric fireplace for a cozy atmosphere, or turn on the 60-inch big screen TV and pop in a DVD for a movie night. 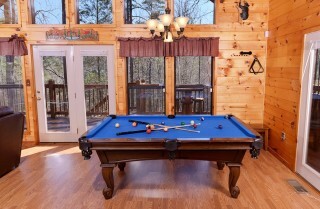 If you love to play board games, bring your favorites along and take advantage of the coffee table here. 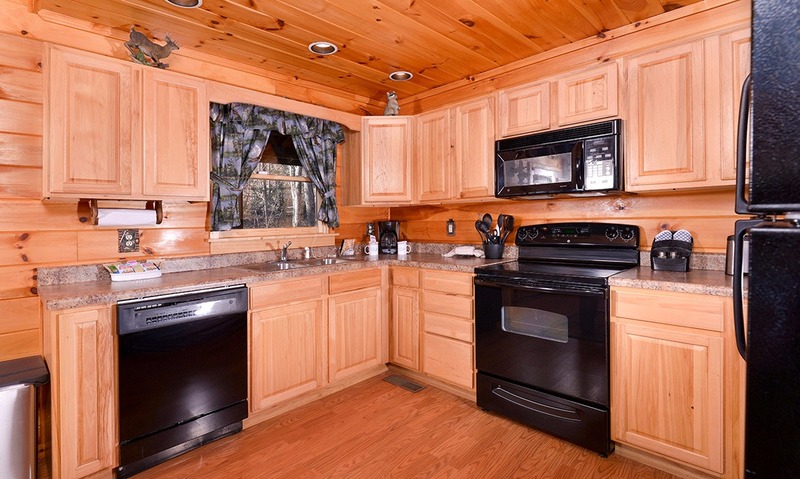 Whether you want to save money by eating in the cabin or just want some extra quality time with family and friends, having a fully equipped kitchen in your cabin will be a convenience you’ll demand after staying in Amazing Grace. Here you’ll find the essentials for cooking meals for the group, including black appliances and ample dishes, glassware, and utensils. 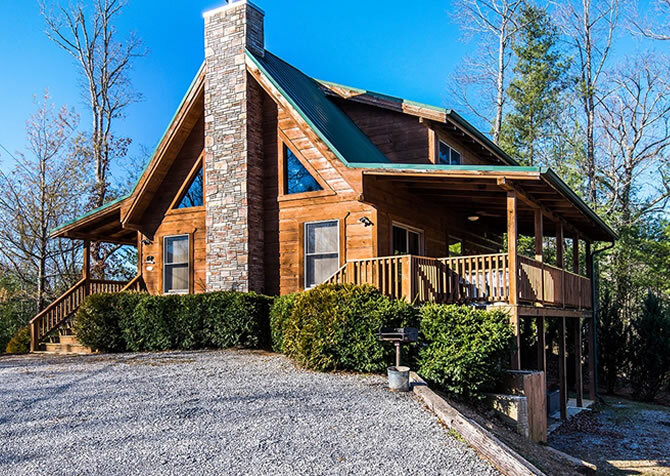 You can take advantage of the fresh fruits, veggies, and baked goods at the Gatlinburg Farmers Market (from May to October), or you can just use the kitchen to store leftovers, ready-made snacks, and drinks if you’re not up for cooking. While there are plenty of great places to eat downtown, dining in the comfort and privacy of your own cabin is a great option. 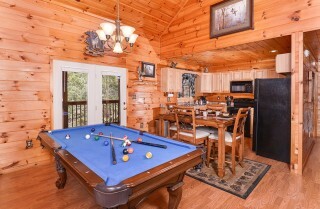 The dining table features seating for 4, and other guests can gather in the living room or enjoy a meal out on the deck. When you want some extra time together, gather here for family-style meals. If you’re here with couples, sit down for a romantic meal with an atmosphere you won’t get downtown. 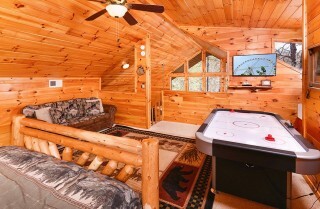 Or you can use this space to set out a buffet of snacks during a big game. Check out our blog for recipe ideas throughout the year or just bring your favorites! Vacations in the Smoky Mountains typically mean busy days exploring the trails and historic sites in the Great Smoky Mountains National Park, browsing the shops along the Parkway, playing at Dollywood and Dollywood’s Splash Country, testing out fudge and sweets in Pigeon Forge and Gatlinburg, racing go karts, hoping for holes-in-one at mini golf, and checking out all the awesome family-friendly attractions in the area. So after all that, you want a quiet, comfortable, and relaxing place to unwind. 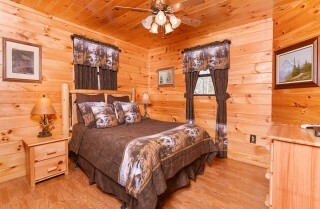 Amazing Grace offers just that in its cozy 2 bedrooms. 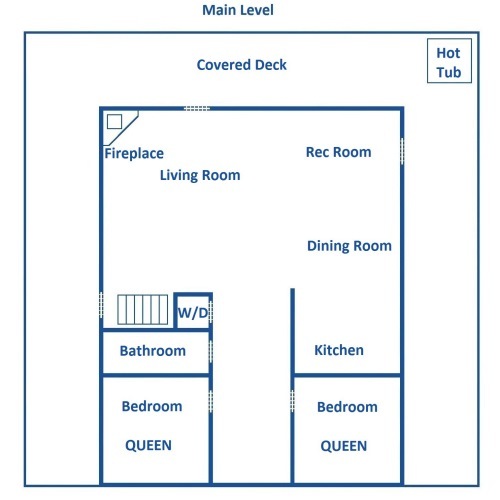 On the entry level, the 2 bedrooms feature queen-size beds. Each room is outfitted with fun mountain décor and cozy bedding you’ll want to climb into at night. 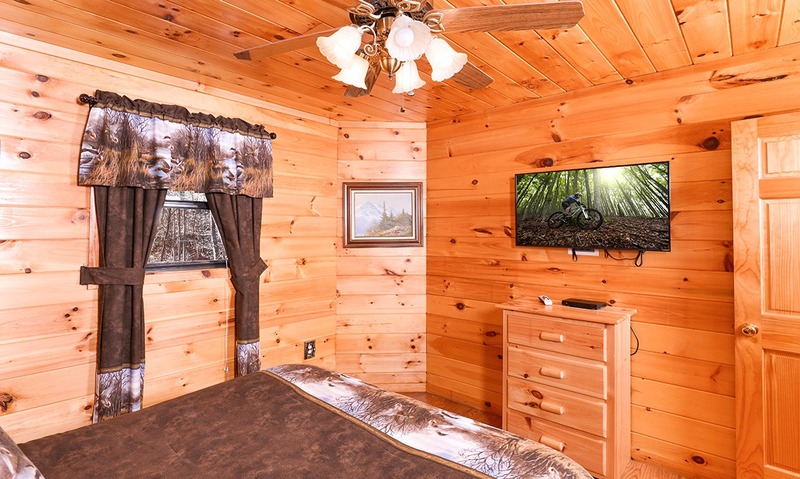 The rooms also have conveniences like nightstands and lamps for late-night reading or keeping phones nearby and their own TVs. 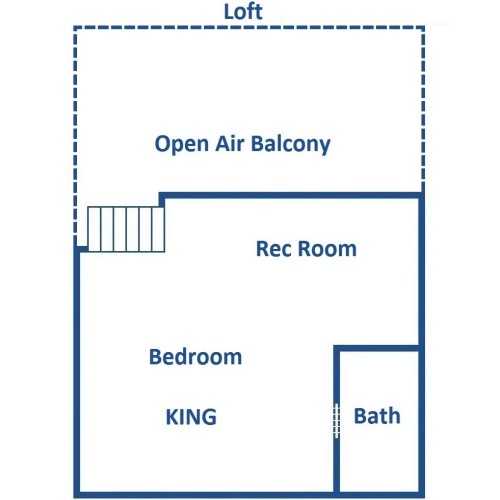 For extra sleeping space, Amazing Grace has a king-size bed in the loft and 2 queen sleeper sofas (1 in the living room and 1 in the loft). Two full bathrooms provide plenty of space for getting ready. 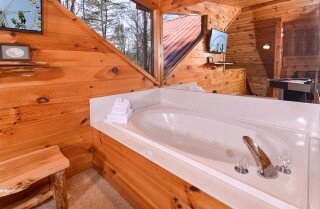 You’ll even find a jetted tub in the loft, where you can have refreshing baths before starting your day. 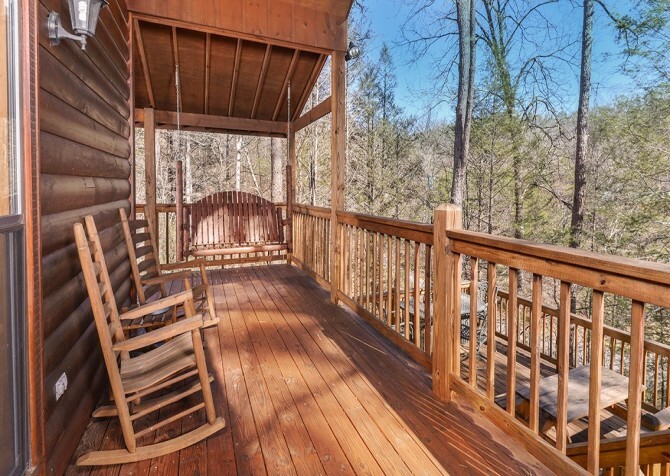 You can’t come to the Smokies without enjoying some time in the great outdoors. 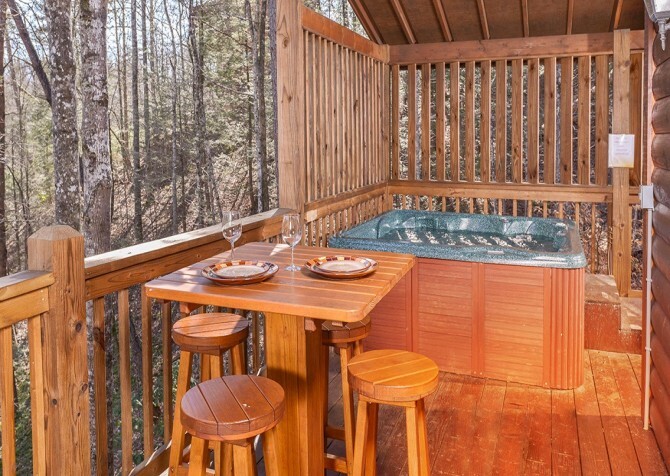 At Amazing Grace, you’ll find that the outdoor spaces welcome you to sit down and soak in the peaceful mountain surroundings. 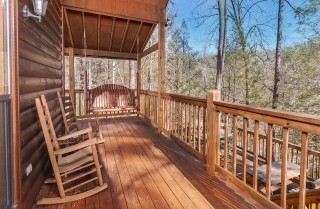 Have a glass of wine, a cup of coffee, or a glass of ice-cold lemonade while you sit in the rocking chairs or kick your feet up on the porch swing. 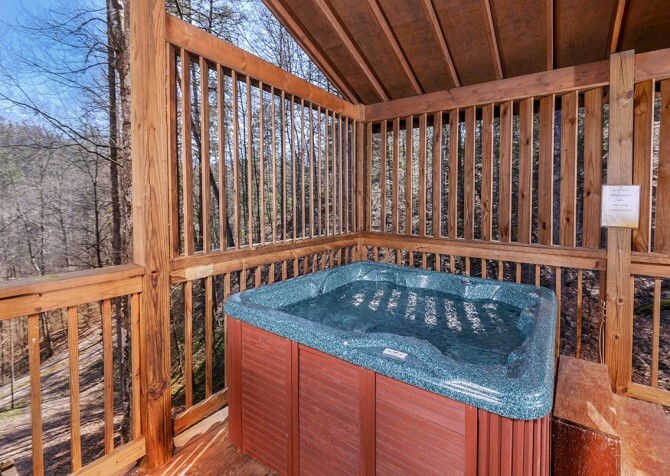 At night, relax beneath the stars as you soothe those tired muscles in the bubbling hot tub on the deck. 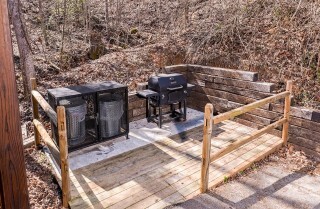 Or you can fire up the charcoal grill for a fun barbecue with chicken, steaks, and grilled veggies. You’ll find plenty of places to enjoy your outdoor meals, from the dining table and the picnic table to the high-top table by the hot tub. Whether you’re cooking, sitting, or soaking, take the time to slow down and enjoy a different pace of life. 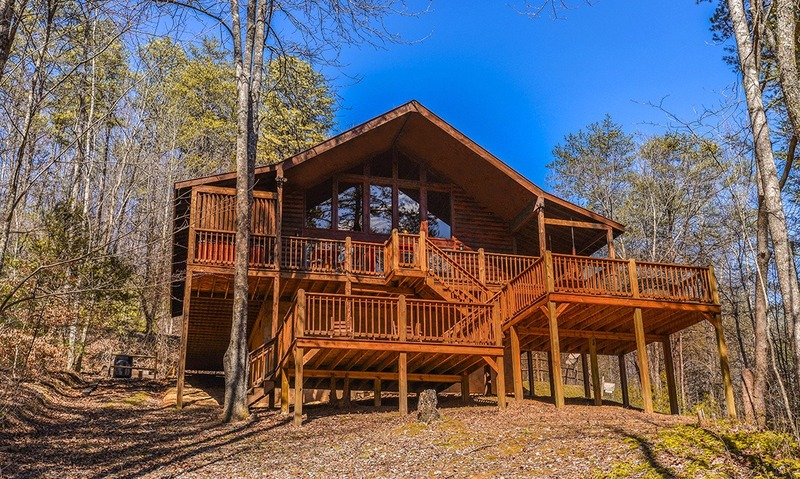 Breathe in that fresh mountain air, listen to the birds, and reconnect with nature in one of the most scenic places in the country. 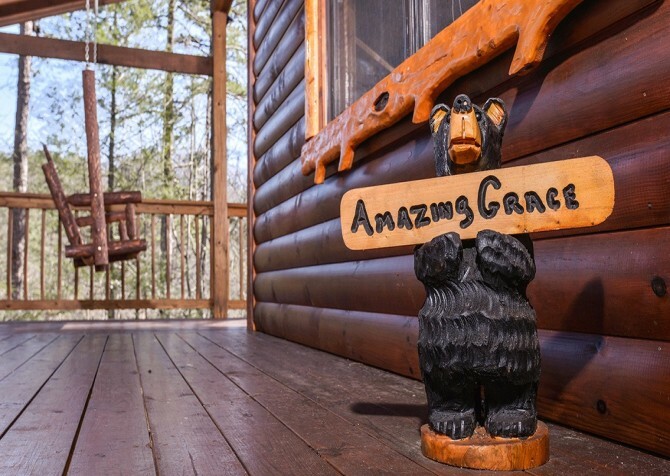 If you want a convenient place to stay, Amazing Grace is it. 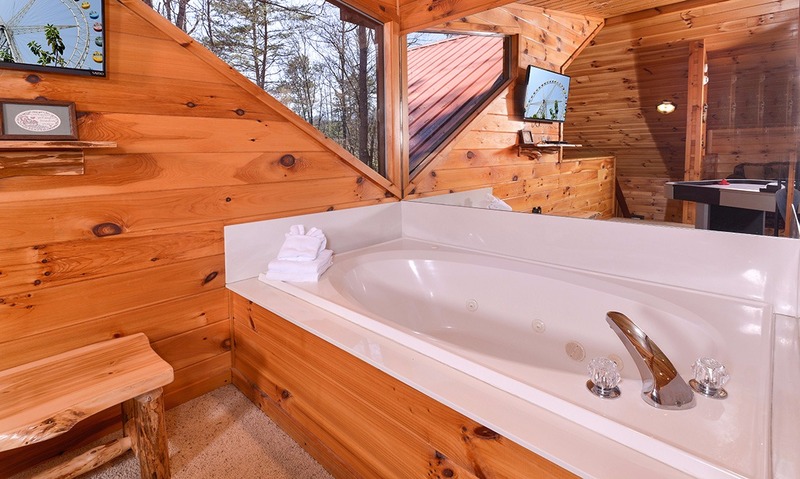 The washer/dryer is a much-appreciated amenity when you’ve been hiking all day, gone swimming, or if you love to have a suitcase full of clean laundry before heading home. 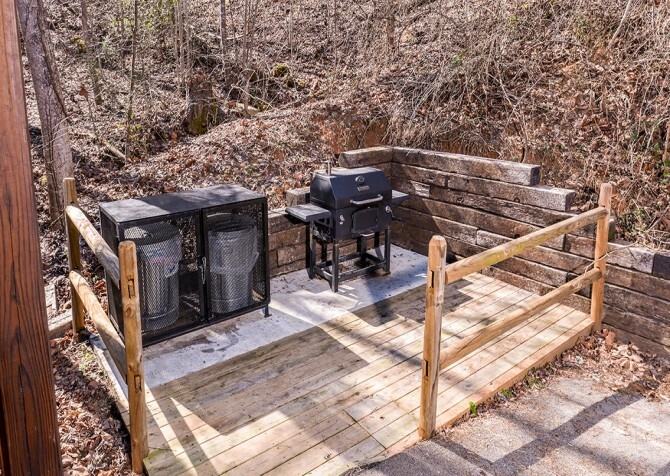 When you arrive, the flat, paved driveway will take away a bit of that mountain road anxiety, and you’ll have 2 parking spaces. There is also only 1 step up into the cabin, so you can easily unload and get your vacation started. We know that you probably want to stay connected while on vacation – whether for emails or posting pics of what you’re doing – so the high-speed internet will come in handy. Or you can use it to keep up with our blog, where you’ll find travel tips, recipe ideas, history highlights, and information about area events and attractions (and deals!). You’ll also have free long distance phone calls, so you can get in touch with the ones who couldn’t come along. 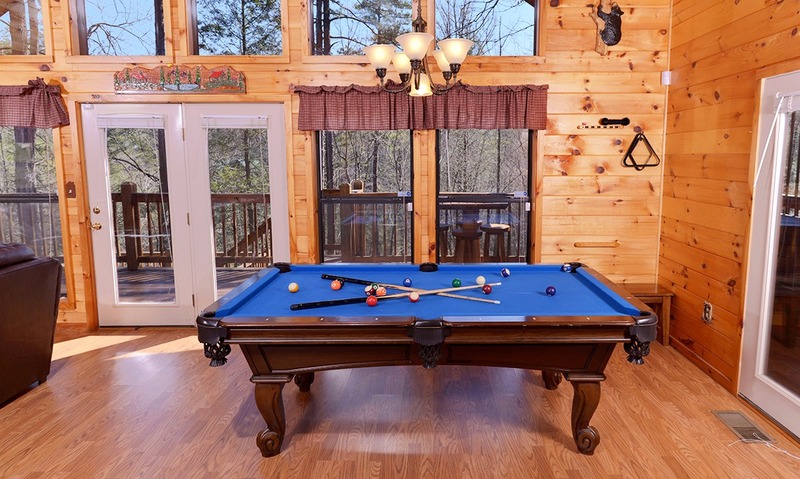 And when you’re ready for some fun, check out the games in Amazing Grace. 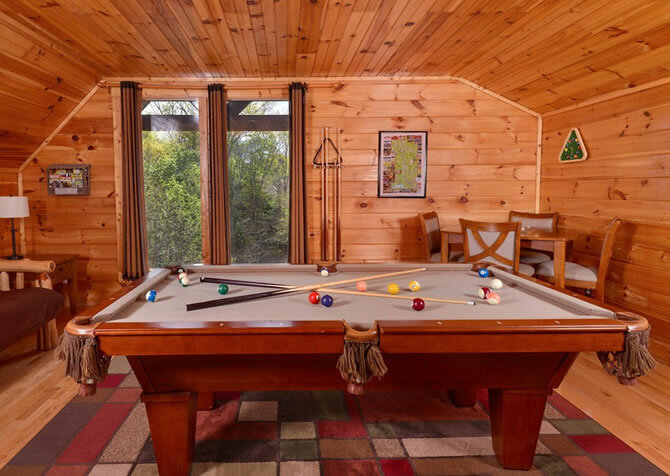 Between the pool table in the living room and the arcade console in the loft, you’ll have hours of entertainment for kids and adults – right inside your cabin! Amazing Grace is perfectly situated for those with a diverse or picky group, near the attractions, shops, and restaurants of downtown. Cuisines span the globe, and candy shops offering dipped apples, fresh fudge, taffy, and old-fashioned candies are sure to satisfy the most serious sweet tooth. 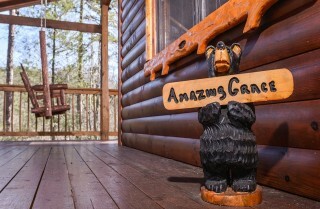 Area attractions also have something for the kids (and kids at heart), with fun places like Fannie Farkle’s, Paula Deen's Lumberjack Adventure, and The Island in Pigeon Forge. The busy Parkway also has miniature golf, go karts, laser tag, and plenty more for any mood you’re in. 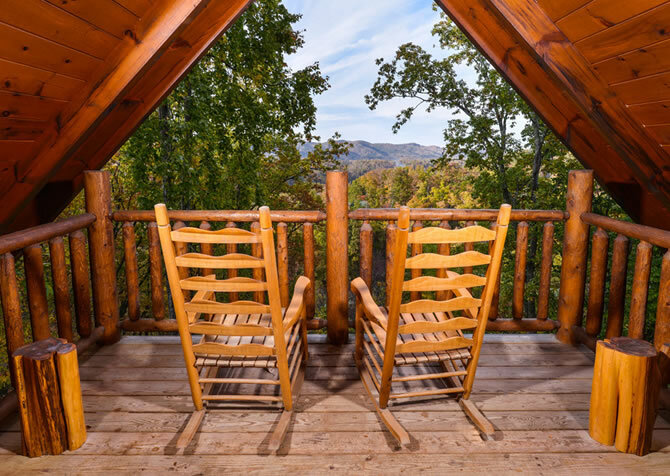 No matter what kind of vacation you're looking for – fast paced or relaxed – Pigeon Forge has it all. Need some ideas? Here are just a few great local places. Watch some incredible athleticism (and enjoy the hearty Lumberjack Feast) at Paula Deen's fun and family-friendly attraction. It will be a night of excitement that everyone will love! Break away from the typical attractions and challenge yourself to an exciting hour of puzzles, codes, and brain benders. If you can escape within an hour, you’ll have bragging rights forever. Towering over the city of Pigeon Forge, the Great Smoky Mountain Wheel is a fun ride that offers you some of the best views of the area. Ride it during the day for great city (and mountain) views, or hop on at night for a light-studded ride. "Amazing Grace in a word is amazing.Amazing Grace is a perfect place for a group of friends or a family get away.With its two family rooms and three decks It is large enough for everyone to get together and also if you want to get…"
"Amazing Grace in a word is amazing.Amazing Grace is a perfect place for a group of friends or a family get away.With its two family rooms and three decks It is large enough for everyone to get together and also if you want to get away by yourself and read or take in the view. We have been coming down as a group for 30 years the last 3 in Amazing Grace.In fact we have already rented it for next year.Working with Cabins for You has been fantastic.We had an issue with something as minor as a toaster not working and the next morning we had a brand new one.Amazing Grace has everything you would need for a large group vacation." We're so glad you experienced a wonderful stay at Gatlinburg Amazing Grace! Thank you so much for taking time to leave this very kind review. We treasure our repeat guests, and we sincerely look forward to serving you for many more years to come! 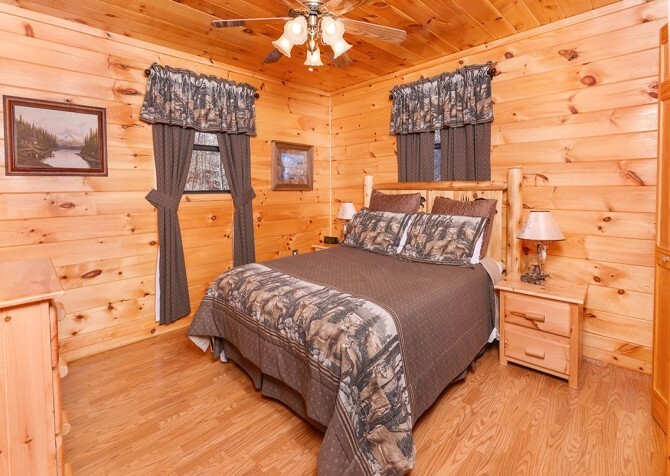 "Great place to stay - I highly recommend this cabin!" 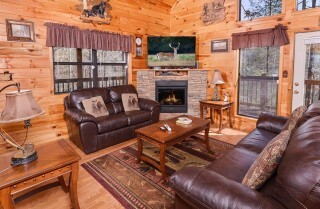 "Love this cabin!! We had a great time. The view was fantastic, so peaceful :)"